Scientific Games, the industry leader in portrait video cabinet innovation is creating waves again with the launch of the TwinStar® Wave XL! Like its predecessor, the revolutionary Pro Wave® with its industry-first curved display, the TwinStar Wave XL will take the player-experience to the next level, showcasing a 49-inch, curved, touchscreen display that offers versatility and a comfortable player-experience. The dynamic display showcases an astounding 4k, ultra-high-definition display, generating the kind of stunning graphics only seen in high-end home theatres. The TwinStar Wave XL also showcases an even larger, award-winning iDeck™ and an even more advanced lighting and sound package. The TwinStar Wave XL premium configuration features a 32” topper and is available in both an in-line bank and circular 360 bank configuration with a premium LED sign package. It debuted early this year in the U.S. with Jin Ji Bao Xi™, a game which is already SG’s #1 linked game in Asia and developed by the same studio that designed the hugely successful Duo Fuo Duo Cai® series! 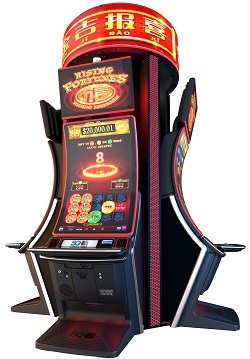 Catch the wave and get this powerful cabinet on your casino floor!